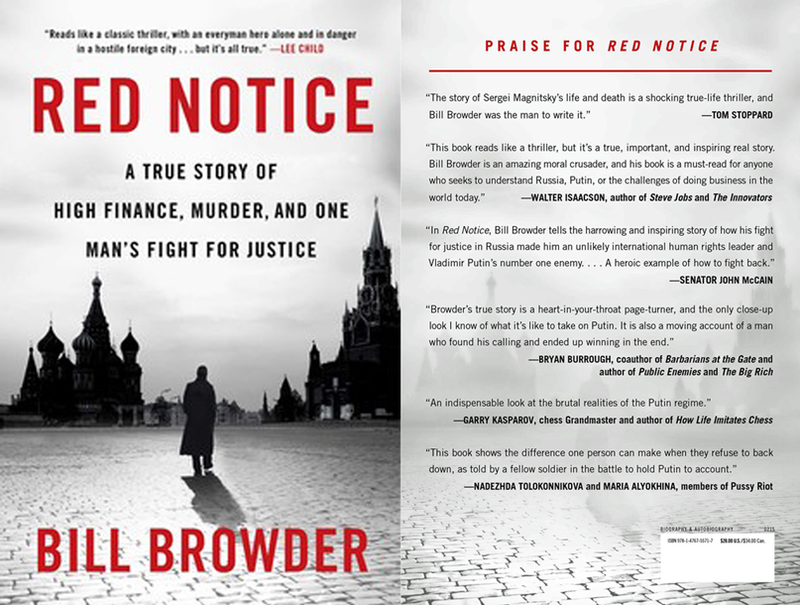 The timing of Bill Browder’s new book, “Red Notice,” is quite impeccable. After years of craven appeasement, the West finally realized the failure of its “reset” policies with Russia. “Red Notice” provides a powerful glimpse of what’s been taking place in Putin’s Russia, while the world looked the other way. As the hedge fund manager, Browder was hugely successful with Hermitage Capital Management, a company he founded in Russia in 1996. It became the largest investment fund in the country. Browder was the prime example of succeeding the right way – without chicanery, fraud or embezzlement. This was the surefire way of irritating corrupt Russian elites. Big business and big government in Russia are intrinsically intertwined, brazenly operating as organized crime. Vladimir Putin is the Godfather of this far-reaching mafia family. He empowered the group of his cronies to enrich themselves at the expense of Russian economy, on the backs of the country’s long-suffering people. Resounding success of Bill Browder’s company, combined with his efforts to expose and uproot corruption, brought on the ire of the Kremlin gangsters. In a brazen conspiracy, Russian authorities stole Browder’s companies, prevented him from re-entering the country, applied for and received a $230 million tax refund for the monies paid by his fund’s companies to the Russian government. Having declared Browder a “threat to national security,” Russian authorities shamelessly helped themselves to the largest tax refund in Russian history, which was paid out the next day after being requested – no questions asked. Bill Browder vowed to avenge the death of his honorable attorney. He pushed for travel and financial sanctions against the Russian officials who were involved in Magnitsky’s imprisonment, torture and death. Overcoming DC’s initial reluctance, Browder achieved the passing of the Sergei Magnitsky Rule of Law Accountability Act in Dec. 2012. The European Parliament followed suit, without a single objection. Browder is now pushing for a global version of the Magnitsky Act, to hold human rights abusers accountable worldwide.